Celebrating the beginning of a new year often brings to mind those areas in our work and lives we would love to see improvements. While most of the time fostering transformation takes a great deal of effort on our part, there are some changes we can implement with greater ease thanks to modern technology, such as RFID (Radio-Frequency IDentification) automation. If you have resolved to discover the benefits RFID inventory management can bring to your hospital pharmacy, especially in improving the management of kits and trays, you’ve come to the right place. Below we’ve gathered five of the key positive changes RFID can bring to your hospital this year. A recent study found that hospital pharmacies that use manual replenishment processes typically have one or more errors in every three to five trays. Conversely, the same study found that using an RFID-enabled drug management process led to 100 percent accuracy in trays with no missing or expired drugs. RFID pharmacy automation also allows pharmacists to better track and optimize their inventory, and quickly make informed decisions that prevent stock-outs of important medications, further protecting patient safety. When it comes to medication, even the smallest mistake can prove deadly. To increase the safety of your patients and improve the practices of your pharmacy, automate your drug management process via RFID and eliminate the potential for human errors. Manually replenishing kits and trays is a tedious and time-consuming task that pulls hospital pharmacists away from more important patient care needs. A news article featured on ModernMedicine.com found that two hospitals, Rady Children’s Hospital (RCH) in San Diego, and Inova Fairfax Medical Campus (IFMC) in Falls Church, VA, have reported dramatic increases in efficiency since implementing an RFID system for managing meds in their OR trays, emergency drug trays, intubation trays and crash carts. 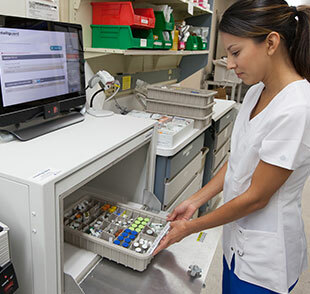 Quynh Vu, PharmD, BCPS, and Inpatient Pharmacy Manager at RCH, said that replacing the hospital pharmacy’s manual system with RFID automation has increased both efficiency and productivity. The American Journal of Health-System Pharmacy reported that the rising prices of drugs led to an 11.7 percent increase in costs in 2015 for hospital pharmacies in the U.S., and this trend is expected to continue in 2017. One of the easiest and most efficient ways to better manage and optimize hospital pharmacy inventory is through RFID automation. When kits and trays are managed via RFID, hospitals can use real-time data to better understand their true inventory needs, eliminate medication waste, and reduce inventory costs. FDA drug recalls are surging and that trend is expected to continue. A daunting task, managing drug recalls is both a time-sensitive and time-consuming process that requires pharmacists to know the location of every drug in the hospital. Fortunately, RFID pharmacy automation takes much of the stress out of drug recalls and audits (such as those conducted by the Joint Commission on Accreditation of Healthcare Organizations – JCAHO) by giving pharmacists instant insight into the location of all drugs in the system. RFID solutions like the Intelliguard® Kit and Tray Management System feature a Virtual Logbook that empowers users to search for recalled drugs by lot number or medication name. When a search reveals a recalled drug, users can flag the medication in the system and run a report that provides the location, quantity and status of all instances of the recalled drug in the hospital. In a highly competitive job market, keeping employees happy can feel like a full-time job in and of itself. One way to boost staff morale is to empower them to spend more time doing what they love by reducing time spent on tasks such as item-level scanning and manually counting the drug inventory of kits and trays. By using RFID to automate kit and tray replenishment, hospitals enable pharmacists and staff to spend more time focused on high value patient care tasks, which not only increases efficiency and productivity, it enables staff to derive more satisfaction from their work. To learn more about how you can use RFID to automate, validate and manage your hospital’s drug inventories, request a product demo, today.